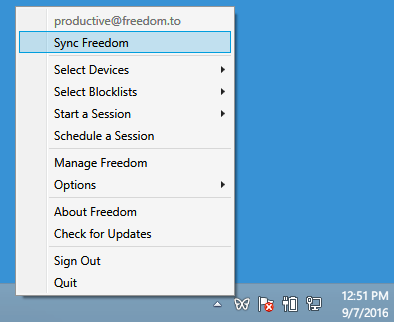 This article provides instructions on how to manually synchronize Freedom. Issue: I've updated my devices/blocklists/sessions on my dashboard, but the changes are not showing on my app. How do I fix this? Sometimes because of intermittent network problems, you may find that Freedom does not update device, filter list, and active schedule information automatically. On much rarer occasions, intermittent network problems may also cause blocks to not start or stop on time. 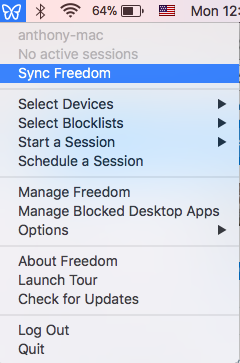 In these cases, you can manually synchronize Freedom! Click on the butterfly icon in the system tray. Click on the butterfly icon in the menu bar. To update Freedom on iOS, simply open the app. Whenever it is launched, it will update itself.